The joint Cemore | T2M | Cosmobilities conference ‘Mobile Utopia’ invites submission of individual papers, panels, artworks, posters, and other creative formats. 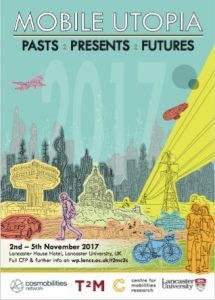 The conference will be held on 2-5 November 2017 at Lancaster University. The deadline for the submission of abstracts and sessions is 31 March 2017. For conference details, see the conference announcement and the conference website.